All of us labor at the garage sales and thrift shops, hoping to score big on every find. But let's face it, not every find is going to turn into big bucks. In fact, some can turn into a big bust! Sometimes it's because the item bought turns out to be broken. Back a few blogs ago, I described how I repaired a shortwave radio then sold it for over $200 bucks. That potential bust turned out great, but what if you just can't fix it, are you stuck with a loss? Maybe not, here's an example of a small salvage operation that saved me money. Above is a Eighties era "Speak and Math" computer toy by Texas instruments. I bought this at a garage sale for three bucks. These vintage computer toys do very well on eBay. The company also makes a "Speak and Read" and other educational models. I've sold a few of these and usually get around thirty five dollars for each one. So when I bought this one, I figured I had another thirty bucks coming my way! But when I got the toy home and popped in some batteries guess what happened? Absolutely nothing...the dumb thing would not turn on! So there I was: three dollars in the hole and a dead toy...a major bummer! Hating to just throw away a hunk of plastic, I considered selling it "as-is". Maybe a handy fix-it type buyer would buy it and get it working. But I was just kidding myself, there's not a huge demand for broken electronic toys from the Eighties. However researching further on eBay, I noticed a common trend with the "Speak & Math" toys. A fair amount of sellers were selling the toy with a missing battery door. This is a common bug-a-boo with many toys, the battery door goes missing like some kind of escaped convict busting out of jail. (Don't even get me started on TV remote battery doors, mine is always leaping off the clicker and tunneling itself between the couch cushions!) So while my toy didn't work, it did have one thing going for it...the battery door was still present and accounted for! In a desperate attempt to recover my initial three dollar investment, I decided to try to sell only the battery door. A collector would have the opportunity to make his Speak & Math complete...I was like a matchmaker! I listed the battery door for five bucks with free shipping. I had to be the only seller in the whole eBay world listing a Speak & Math battery door, but you know what? The little piece of plastic actually sold for five dollars! After paying a minimal shipping cost and listing fee, I was now in the black instead of the red! You may be thinking, "Dude, you made a few bucks...what's the big deal?" Well, in this business you have to avoid taking losses, even a small one. I was almost stuck with a worthless toy that cost me three bucks, but instead I recovered my initial investment and then some. Now I could put that money back to work for me. Maybe those recovered bucks would buy me a doll that I could flip for fifty, or a team jersey that makes me a hundred! It's basically a chance for a do-over ! So if you buy stuff you think is broken and worthless, don't write it off just yet. Look it over and try to salvage something from it. You may be able to turn lemons into lemonade! Have you ever been low-balled by potential buyers regarding your auction prices? It's happened to me more then once. Watch out for bidders who will test you with an e-mail asking for a low "Buy it Now" price. Their objective is to snap up your item before it can be bid up by other buyers. Don't let them fool you! If you're confident you've done your eBay or Terapeak research on it's value - stick with your price. Here's a case in point on staying at your price: I found this slot car set at a local thrift store for just six bucks. Vintage slot cars and trucks are a hot eBay item and always see good bidding action. If you see them at the garage sale or thrift shop don't pass them up! 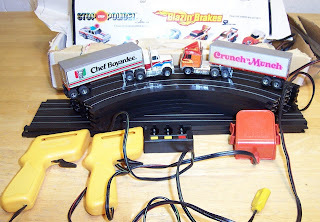 This particular set was a pair of racing trucks sold by Chef Boyardee back in the early Eighties. They were part of a mail order promotion and could only be purchased from Chef Boyardee. I was pretty stoked when I found them. For only six dollars, I had a special edition set complete with hand controllers and track. Throw in the fact they were never used and in the original box...a total eBay home run! "You want fifty bucks for that? Ha, good luck!" This guy was a real downer! But I responded back with a friendly, "Yeah, that's a good deal for the set right? " His terse response, "Ha, yeah right. I'll give you twenty"
It's never a good thing to start an e-mail war with some folks, so I ignored his smart-alecky e-mail offer. I knew full well this set was going to soar in price....but I did hold onto his e-mail for a later time. As mentioned, there are a tremendous amount of slot car collectors on eBay. Just as I anticipated, bidders got revved up for my Chef Boyardee truck set. The fifty dollar starting bid didn't slow down the collectors at all. The auction bidding went viral and closed with a final price of.... are you ready?.......$103 dollars! Boo-Ya! He quickly responded back and unfurled a few inappropriate words on me and called my wonderful buyer a bleeping idiot. I am not sure why he was so upset, but his angry, over-the-top reaction cracked me up! So don't let the naysayers and tire kickers keep you from earning your money. If you have done your eBay homework, stick to your price and you'll be rewarded!